AND I SMILE AT THEM FROM THE CENTER OF MY SOUL. Fall is a great time of year to begin an outdoor fitness routine. Really anytime is good to get started, but the cooler temperatures make it more fun. Join us Wednesdays for a trail run on the farms Wild Fitness Trail. Our trail is approximately a mile long and is suitable for all fitness levels. I am a “two-looper” myself. It loops around the farm along the stream, past our pond and back along the edge of our production fields. Trail runs start at 6pm. Sneakers or closed toed shoes are recommended. No dogs or unsupervised children but check back for future dog walks and/or children’s fitness activities. Stop by our farmstand this Wednesday between 6pm and 7pm for a free demonstration in probiotic food preparation. AND show you how easy it is to do it yourself! Join Us for Our Fitness Walks. Wednesdays at 5:30pm starting May 18th 2016. Once a year spring peepers make their journey from their winter homes, frozen under the forest floor, to spring mating grounds. Vernal pools, ponds, to whichever body of water they were born into, they shall return, to continue the cycle. But the conditions have to be just right for these tiniest of amphibians. Rainy, above freezing and after the sun has gone down and darkness fully sets in. This migration tends to happen unnoticed, but what most people do notice is the amazing chorus of “peeps” we hear in the evenings. It seems like the peepers are coaxing along those first signs of spring. As that first crescendo floats through the air, the peach buds swell, the chickweed, nettles, and dandelions turn a vibrant green, magnolias, daffodils and blooms of every color open and there is the chatter of birds and insects checking in after a long winter. All the while spears of asparagus lie just millimeters below the soil surface, hearing the symphony above, knowing their turn is so near. Do they nudge one another? “You go first….no you” or do they just give in to the “greensong” and absorb into the magic dance of the ages…the arrival of spring. Sprouting, hatching, budding, mating, waking – so alive! You know we humans are part of this all too right? We only need to remember, to recognize that song and dance that is part of our very souls. Spend time listening, watching, just being in the natural world. This alone, many believe, can boost your immune system. “Researchers from Japan’s Kyoto University have determined that outdoor therapy – including forest walking, gardening and yoga meditation – not only will increase well-being and quality of life: It will also strengthen the immune system”. Imagine experiencing a feeling of rightness about yourself and your place in the flow of life. “We are all part of this universal creative energy” -Sandor Katz. WILD FITNESS at North Slope Farm – trails, exercise and stretching stations to be developed in 2016 ! If you are interested, click our Email Newsletter button, and sign up to receive news about North Slope Farm – including developments in Wild Fitness! General Observations: Construction of our new high tunnel is complete and it is already providing a home for our late season tomatoes. An entry made by the farm manager; “Tools, drilling, generator use, multi-person tasks all performed excellent”. Thank You NSF crew 2014 for those many days working till dark and to past crew members who came to help out. Seed saving was pursued by several NSF crew members and we now have plenty-o-kale seed packed away for future use. Experienced crew members took on a heavy load as farm mangers back was not cooperating this month. Administration(51.5hrs. ): (7/9) MR working in office to pay bills and conquer any paperwork piling up. (7/16 & &/29) Bank Deposits (7/15) Staff meeting to discuss priority tasks and receive a crash course in managing our strawberry plants. Harvesting(388hrs. ): Many bounteous bean and carrot harvests. We harvest tomatoes, summer squash, cucumbers and flowers Tuesday, Thursdays and Saturdays to keep up with the high yields at peak season. The bulk of the hardy greens and root crops are harvested on Thursdays with a smaller harvest on Wednesdays for our on-site farmstand sales. 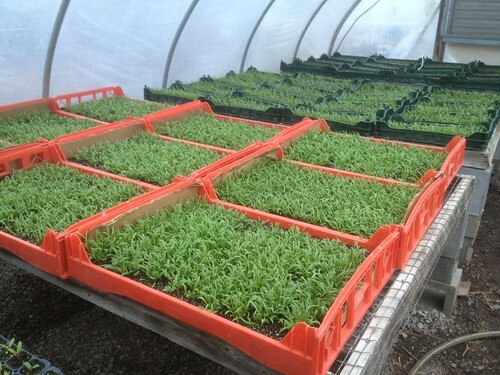 Microgreens are cut and packaged for market on a weekly basis. (7/11)Garlic was pulled and set to cure. (7/7 &7/10) Several varieties of herb teas (Spearmint, Mountain Mint and Echinacea) were harvested dried and stored. A training opportunity arises in the tomato field. We review and introduce to new crew members the stages of ripeness from breaker to “red ripe” and discuss the special handling for those delicate heirlooms. Handling(61.5hrs. ): Hydro-cooling greens, spray washing roots and packing produce for market are weekly tasks assigned on a rotating basis to full time crew. First years have taken on the weekly egg washing and packing. Flower bunching takes us into the evening Fridays and well into the evening Saturdays. (7/9 and 7/15) The dried mountain mint, Echinacea and spearmint tea leaves are stripped from the stems and packed into storage bags. Marketing(132hrs. ): Salad mix, chard and kale sales all down from last year. ??? Equipment(25.5hrs. ): We rented a scissor lift for high tunnel construction. It’s a really tall tunnel. Composting(32hrs. ): (7/9) 1 Big bed and 2 small beds in the CG. (7/30) Furrows in VegBN field. Planting(50.5hrs. ): Microgreens are seeded weekly. 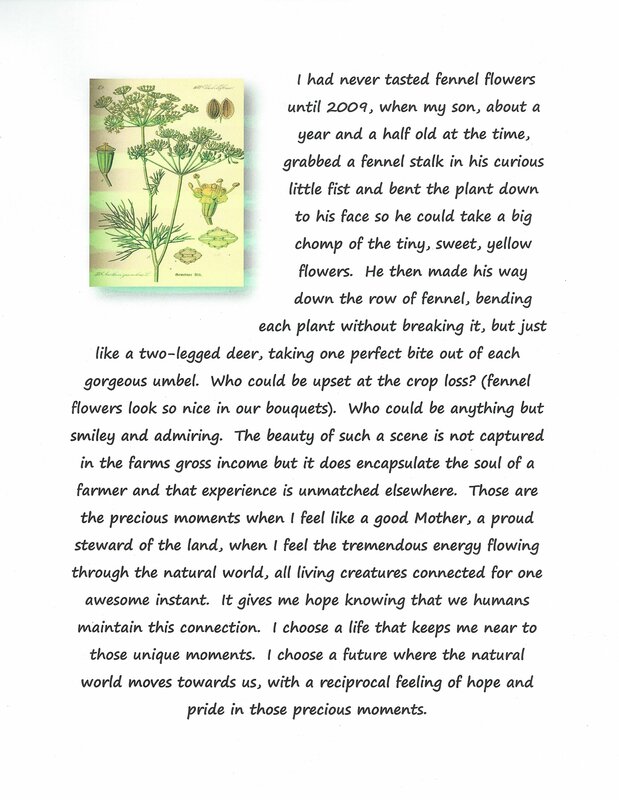 We aim to direct seed carrots and salad mix every new moon. (7/15) Beds ripped with IH140 in new high tunnel. Single shank down the center. (7/16) VegBN being prepped for forth succession planting. VegBS mowed off in preparation for primary tillage. (7/17) Six beds of tomatoes planted in our new high tunnel. (7/18) BGB’s seeded with salad mix. Decision made to cut short stale seed bedding and skip 2nd composting to get the job done on schedule. (7/22) Used NSF saved kale seed for trial round of micro greens. (7/30) Kale, chard and beets are planted into VegBN furrows. Next round of BGB’s are mowed off and rototilled for stale seed bedding. Crop Care(129.5hrs. ): (7/2) Flower field is all staked, strung and weeding and in good shape for now. (7/7) CG pathways and empty beds “billy goated” and weed wacked. (7/9) Zinnias in FG strung again to support weight of plants and keep aisles clear for harvesters. (7/10) Cucumbers trellised and mulched. Bonus! Irrigation reaches top of the task list and will remain there until rain is forecast. (7/16) Hoops, sandbags and row covers removed from strawberry beds, d-tape tucked in and beds mowed off. While we are out there we threw another sting up on the flowers and cleaned up and mowed off any flower beds that are past prime. Winter squash square mulched heavily with straw. (7/18) Hand weeding carrots in BGB. Looks purdy! (7/22) Wired set in new high tunnel and strings hung for clipping tomatoes. (7/25) scuffle hoed newly germinated salad mix. Laid d-tube on carrots and worked on tomatoes in Ralph’s house; clipping and stringing. Greenhouse(66hrs. ): (7/5) Tomatoes in Ralph’s house trellised. (7/15) Crew seeded next field succession into flats. Infrastructure(178hrs. ): *Note: High tunnel construction hours were recorded mostly under this category. Plenty of mowing and irrigation repairs. (7/7) Mowed perimeter of flower field. (7/8) Mowed and weed wacked fruit cluster. (7/8) Ford was used to mow VegCMid (7/9) Sprinkler lines repaired. Needed to decrease spacing between heads for more uniform watering. Irrigation in VegBMid also received some new parts after 5th slice in submain was discovered. (7/10) MR cleaned walk in cooler. (7/16) CSE field mowed. (7/18) More sprinkler repairs. (7/27) Weed wacked and cleaned up around barnyard. (7/30) Drip tape and misc. materials cleaned out of VegBS and it was mowed off. Special Projects(2.5hrs. ): *Note: High tunnel construction hours seem to be recorded under the element infrastructure. Crew are fine tuning the building process as they construct high tunnel #1 to enable maximum efficiency in the construction of the second high tunnel. (7/2) Perlins raised, cables attached to framing. Pre fab action in ATV trailer; cutting cable, making loops and securing with cable clamps. (7/4) Channel lock attached to end arches. (7/8) Ribbon board bolted on and double channel lock mounted on. New construction term introduced to crew “countersink”. (7/15) All hands and paws on deck for 6am start to put “the skin” on the new high tunnel. Plastic secured to channel lock on peaks using the JD bucket as a ladder and from the ground secured to channel lock on ribbon board. Week 1 Heavy rain forecast, humidity building. High 90’s. One thunderstorm but hurricane landed south of us which brought cooler, breezes, slight rain and a bit of sunshine. Week 2 Sunny and dry conditions by the end of the week. Week 3 Thunderstorms push through and it is humid and calm between storms. 4 inches of rain in a few days. Week 4 Month ends on a very dry note. Drought and fires out west. General Observation: Major materials delivery received involving much planning and preparation to ensure safe, efficient offloading. All went smoothly. We also prepared for a shipping container to be delivered requiring a bit of site preparation as well. We have a goal of constructing at least one of the newly purchased high tunnels this year, which involves equipment rental and training the crew to use the machinery. This leaves the farm manager to juggle all these special projects on top of routine season startup tasks. By months end the greenhouses are completely filled (including pathways) with seedling flats. Planting has begun and water systems are charged up for irrigation and greenhouse watering. The crops required extra care during the second half of the month which brought strong, gusty winds and frosts in the evenings. Equipment (16hrs. ): MR purchased Seabox 20’x 8’x 8’ shipping container (not reflected in cash flow). Equipment modifications done on big blue trailer and a chain hoist was rigged up for coming delivery. 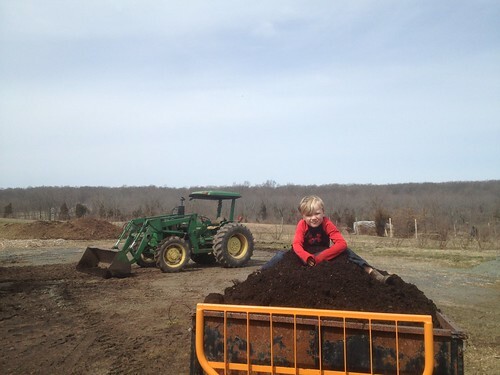 (4/7) Solebury orchards came to pick up drop spreader (shared equipment). (4/11) Ford front tire taken for repair and reattached. Worked with the following rented equipment for the High tunnel #1 special project: (1)two man post hole digger (2) post hole digger on skid steer. Crew was instructed in safety and operation of skid steer and each had an opportunity to drill holes and scoop and spread compost. (4/29)Everitts Equipment picked up hay bine to replace the belt. Administration (69hrs. 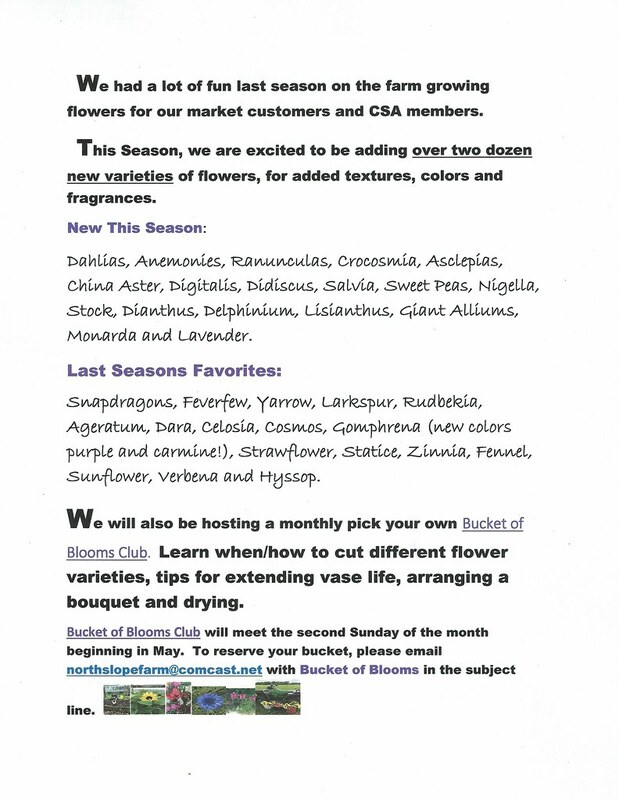 ): Greenhouse order sheet for market seedlings e-mailed to wholesale customers. (4/7)MR paying bills, ordering cow pots and some misc. tasks in office. (4/20) Daily log getting forgotten in the bustle of projects underway. So we catch up so that valuable information is not lost and move on. (4/23)Biobags ordered. Spoke with West Windsor Health Department authority who requested confirmation that our bottled products and egg packaging meet government standards. (4/29)Payroll. (4/30)Crew took photos of seedlings and GH greens and uploaded to Flicker. Updated crops available now page on website. MR paid bills, filed NJ 1st quarter report and completed misc. administrative tasks. He is in the clean desk club now!! (4/30) 2013 May summary tackled. Infrastructure (189.5hrs. ): Expected delivery of shipping container and new greenhouses requires planning and preparation. Anticipating 7 large pallets: 2:2500#’s 4’ x 2’ x 12’, 2: 1500#’s 4’ x 2’ x 12’, 2: 1500#’s 4’ x 2’ x 10’ and 1: 1000# 4’ x 2’ x 5’ (4/1) A large A-frame was recovered from the edge of Peters Brook to be utilized in the chain hoist for offloading greenhouse delivery. Site chosen for shipping container two dumps of 2” clean (cobbly lump) spread over area to create a gravel pad. (4/3) Introduction to drainage using corner garden as example including discussion of water table and drainage options (diversions, swales, terraces, tiles) and sheet flow vs. concentrated. Practical done on barnyard drainage. Field bed drainage was jump started by first using the 265 with shanks behind rear wheels to rip the walkways at ends of beds. (4/4) A box truck full of recycling was hauled off. (4/9)Fencing tightened/repaired in market garden and fruit cluster finally gets electric fencing installed. Drainage channels in Veg C South dug out by hand. (4/10)Chickens moved and fencing reinforced. (4/10)BGB cleanup: last seasons d-tape and remay and blackberry prunings removed. Sink holes dug out and filled with concrete. Fenceposts straightened (where needed) and holed filled with gravel and tamped down. (4/11) General cleanup for MR’s birthday. (4/14) At this point in the season daily chores expand to include greenhouse watering and irrigation in addition to the chicken chores. (4/30) Box truck taken on supply run for pallet of potting soil. Farmhouse gang purchased new beds with frames at FDS. Greenhouse (318.5hrs. ): (4/1) Debris cleared and post holes dug on east end of Farmhouse Gothic as first step in construction of end walls. While the west end receives touch up storm repairs: rib re-bending and tightening of plastic. The hardening hoop was cleared, cleaned and packed with tables for overflow seedling flats. (4/2) Hardening hoop renovations: baseboards reset, plastic patched and resecured to end hoop, woodchips from spring pruning project dumped and leveled to south of hoop house creating additional, well drained seedling overflow area. The crew then built a stone retaining wall to complete the project. (4/3) Veg. Succession #1 moved to newly renovated hoop house and a GH watering protocol is established. (4/4) Full crew engaged in seeding. Wiggle wire tune-up on Farmhouse Gothic. Seedlings in hardening hoop protected with double layer of remay. (4/7) Observation made in GH that sunflower showing signs of stress. (4/7) MR demonstrated of setting base beams for end walls onto concrete piers. (4/14) East end wall finished on Farmhouse Gothic. (4/20) Attention on falling temperatures being sure to close up greenhouses tightly at night. (4/22) Potting on tomatoes and herbs. Seeded next round of 4paks for market sales. (4/24) Second full seeding of tomatoes. (4/25) 2nd flower succession seeded. (4/29-4/30) Potting on of tomatoes leaves greenhouse bursting at the seems. Tables set up in Farmhouse Gothic for additional overflow of seedlings. Additional protections on ends of Farmhouse Gothic needed to protect seedlings from draft/cold. Shifting of seedlings becomes routine chore at this point in the season. Composting (24hrs. ): (4/11) Composted 1 100’ bed in Corner Garden. (4/18) Composting continues in BGB section five beds done with extra compost deposited under nearby pear trees. (4/24) 140 and spreader used to compost all open beds in Veg B Mid and Veg C South. Planting (166.5hrs. ): (4/10) Planting in Corner Garden, First of Season. (4/11) 3 BGB’s of kale and cabbage and 1 BGB direct seeded with salad mix. (4/11) MR conducted spoken review of bed prep., layout and spacing. (4/14) All beds in corner garden w/o existing perennials rototilled to chop back ground ivy. (4/18) Balance of first succession planted into BGB’s South East. (4/21-4/22)First field bed planting in Veg C South: cabbage, broccoli, kale, chard and beets. Bed preparation was done using the IH140. (4/23)Time for the first big new moon seeding of carrots and salad mix is upon us and the beds are thickly covered with chickweed (which we love but it is not our chosen crop). Bed tops rototilled to super chop chickweed to be easily raked off beds before rolling. (4/24)Big tractor day. Compost spread, with spreader behind 140, on all open beds in Veg C South and Veg B Mid next to garlic. Then 265 used for second round of ripping on beds. Beds next to garlic rototilled and direct seeded (4/25) with radishes, spinach and turnips using the four point seeder. Crop Care (122hrs. ): (4/3) Finished pruning in fruit cluster. (4/8-4/9)Weeding asparagus. (4/11) Irrigation set up on BGB’s and rebar hoops and remay covering set up to protect crop from coming frost. Let the irrigation begin! A regular rotation is implemented. (4/18) Full crew laid fresh new row cover on today’s planting. (4/22) Remay covering over today’s planting in Veg C South. (4/23)Scuffle hoed salad mix and tuned up remay in BGB’s in preparation for extreme winds this week. Decision was made to remove the remay to eliminate risk of wind tearing it up. 9pm visit to fields, hoping winds die down as forecast so crops can be recovered for the frosty night expected. These conditions keep us busy for the last week in April. (4/24)Weeding perennials in corner garden and general cleanup. (4/25)Sprinklers set up and brought into the irrigation rotation in BGB’s. (4/29)Hand weeded broccoli, onions and collards in CG. Handling (4hrs. ): Weekly egg washing, packaging and labeling. Marketing (7hrs. ): Weekly egg delivery to WEC. (4/7) Egg value calculation shows 1 week yields 40 dozen from 85 birds. Taking into account feed and labor it comes to $6.75/doz to break even. (4/23)Biobag inventory and order made. Local Health authority recommends sani-wipe dispenser to be on hand at WWFM. (4/29) Seedling availability sheet updated for WEC. This is now a weekly task. Special Projects (21hrs. ): High tunnel #1. (4/21) Layout and site preparation for the first of two new high tunnels begins. Crew used established corners to set batter boards to be used to maintain string lines and set post hole marks. First attempt to dig post holes with two man auger only reached 1.5foot depth. Abandoned and rented bigger machine to allow full three foot excavation. Job escalated when realizing these 8’long, very heavy ground posts would need to be set into concrete to ensure solid base. 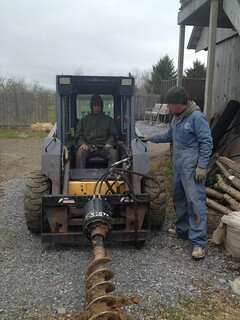 (4/28) Post hole auger on skid steer. Worked until 8pm to set all posts in concrete, level and plumb. Week 1: Peters Brook is flowing and the peepers are peeping away in the pond.. Average lows for the week around 40 degrees, highs between 60 and 70 degrees. A few overcast rainy days but in general, conditions are mild. Week 2: Starts off with heavy rain Monday night but conditions remain mild. Lows 40’s highs reaching 70’s. Week 3: Heavy rains and freezing nighttime temperatures this week. Week 4: Temperatures on the rise again. Looking more like spring with 50 degree mornings and highs in the 70’s. We’re not off the hook though with some extreme wind conditions to confront. Topped off with “crazy rain” and flooding to end the month. General Observations: As tensions in the chicken yard heated up and a violent coup erupted, Big Cheese was found dead. Cause: chicken inflicted wounds. Who done it? The other rooster. Perhaps it was name envy. Elsewhere on the farm, the greenhouses are abuzz with activity. Perennial crop care is the main outdoor job for this month. Special projects are numerous but all fit into the main production scheme with ease. Equipment (10 hrs): Tune up of JD, Ford and trailer. Filled tires, checked fluids and used engine block warmer on JD. Introduction for second years and review for third years of systems, visual inspection and operation procedures for tractors. Additional training for second years on using bucket loader to scoop and fill trailer with mulch, using trickle charger on Ford and engine block heater on JD. Administration (122 hrs): Preparation of materials for beginning of season crew meeting. (3/5) First crew meeting to introduce farm and crew and to discuss crop plan and immediate greenhouse obligations to get the seasons crops started. (3/21) Check in with crew members to review priorities and tasks and responsibilities. General introduction to Administration (hard data file systems, logs, WordPress, Flicker, e-mail etc.) for 1st year trainees and review for returning crew. Created fertilizer order and updated the “Materials Master List” in the Soil Amendments folder. Trainees tasked with summarizing element hours in Excell spreadsheet. Final tweaking of the crop plan and seed order utilizing previous years harvest and market records; a shout out to RR for inventory of seed stock. (3/6) Seed order placed. 2013 element hours summarized and work begins on our monthly summaries for publication on website. Second year trainees work on publishing introductions their special focus for the season. Farm manager interviewed and offered a position to OS. (3/27) Fit in a field walk with the crew which is always beneficial. Cowpots ordered for greenhouse. Infrastructure (41 hrs): (3/7) Water system charged. Freezing nighttime temperatures mean draining the system at the end of the day and charging again in the mornings. Care for chickens a bit more demanding with all the mud. We maintain a layer of hay over the mud in “high traffic” areas within the chicken realm. We made a recycling run. Seed shed basement flooding due to rain on top of saturated conditions. (3/20) Small fire at farmhouse. Alarm system response time quick. Very minimal damage and everyone unharmed. Shoop cleaned and set up as gear storage area for crew!! Thanks TH. Irrigation set up in FG. Supply, materials, fuel run and bank deposit. Greenhouse (277 hrs): Clean up/set up of greenhouse and potting shed. In addition to the foam insulation and heat mats, set up included repurposing of old bunk bed frame covered in plastic for super insulated seedling shelves. Observation of both aphid and white fly infestation on remaining vegetation/weeds on greenhouse floor. Used a dilution of M-Pede sprayed once a week for three weeks to prevent aphid takeover. Overview of greenhouse systems for crew including: circulating fans, inflation, ventilation fan and vents, heat and thermostat and waterline. Humane (hopefully) removal of resident mouse family found living large up in the pilot light box. Temporary “plastic wall” put up sectioning off a portion of the greenhouse to be heated for plant starts. Greenhouse heat officially turned on. Check air and soil temperatures and be sure ventilation and all systems working properly. Watering schedule begins. Formal introduction to seeding given for trainees as needed. (3/7)Seeding begins with an early seeding of tomatoes that are destined for greenhouse production. Seeded 1st round of herbs and onions. Additional greenhouse seeding orders for NSF and wholesale orders gets things really rolling. (3/12) Started seeding our first field succession of veggies (calculated $4/tray in labor and supplies). By end of month there is a fluid routine now preparing greenhouse order forms, compost sifting, mixing potting soil batches, seeding, watering, thinning and repeat. New hose installed in greenhouse!! Bye bye leaks…for now. Supply run to Griffin Greenhouse to purchase Greenhouse Poly ($1,985 for two rolls). New “skin” pulled on and secured to Ralph’s House and Farmhouse Gothic. Weeded Farmhouse Gothic mulched pathways (2cubic yards and 8wkhrs.). BY received verbal and practical training/orientation in greenhouse management and production; from office forms and inventory to irrigation and watering schedules. Composting (48 hrs): Compost sifting for greenhouse potting soil mix is underway (1 bucket load = 1 ½ barrels sifted compost). MR cleaned up compost area with tractor in preparation for today’s compost delivery. A second compost delivery recorded. Big trailer loaded and used to compost older apple trees in farmhouse yard. Composted beds in Farmhouse Gothic and Ralph’s House. Composted blackberries. Planting (20hrs): (3/3) Frost seeded clover and mix of old Timothy and orchard grass over Permaculture Field Western Hay Section in an attempt to establish a hay crop for harvest later in the season. Farmhouse Gothic cleaned up and prepared for planting of edible greens; Special care was taken to minimize carry over of tomato blight. (3/22) Seeded small patch of peas (2×100’ rows) in corner garden. (3/22) Direct seeding of beds in Farmhouse Gothic with greens. Ralph’s House prepared for seeding/planting. Planted dwarf cherries in VegBNP west end. (3/30) Seeded lettuce in RH. Crop Care (109hrs): Cleaned up asparagus beds by quick weeding and cutting back dead plant stalks to 2-4” above ground. Cleaned up grapes in corner garden to make way for grape trellis to be installed. Peaches, Cherries and young apple trees pruned. Blackberries pruned/cleaned up this month as well. (3/14)Introduction to apple tree pruning and practical on oldest apple trees (assassin bug eggs discovered on trees. Set up irrigation, rebar hoops and covered newly seeded greens in FG with perforated plastic. Asparagus mulched with compost. Weeding begins in the Corner Garden with reports of ground ivy take over. Harvesting (2hrs): Harvested overwintered spinach from field tunnel. Marketing (4hrs): Weekly delivery of eggs to WEC. Special Projects (2hrs): Farm Manger meets with mentor (JHR) to discuss this year’s manager focus, financial details, price tracking and an update on recent farmhouse improvements. Work begins on “House spinach trial” in an effort to supply high value product to Nomad Pizza. A weekly seeding routine is established. “Basil Trial” tacked on to spinach. Dedicated shelving for microgreens project constructed; Issues with humidity and overheating addressed. Soil samples taken on first five plots and layed out to dry; Project goal is to sample all of the production plots on the farm this year. Conducting a one month soil inoculation trial in our greenhouse potting mix. Week 1: Weeks ends with heavy snow. Week 2: Snow cover quickly melts with warming weather. Week 3: Cold Winds and some snow followed by rain leaving saturated conditions. Week 4: Continued freezing conditions but the sun is shining. Heavy snow at the end of the month.